Bring the delightful sounds of swing with live jazz for your special event while helping to support our music education fund and mission! An important piece of our mission is apprenticeship—giving our talented emerging musicians the chance to perform. We know that “playing out” hones not only a student’s musicianship, but also such life skills as responsibility and communication. 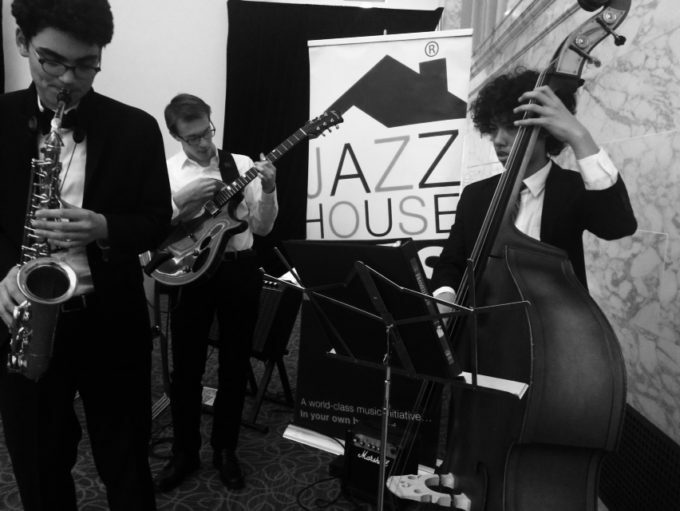 A group made up of some of the nationally recognized young musicians who study with JAZZ HOUSE KiDS offers artistic excellence, professionalism, and a swinging atmosphere that is perfect for parties, receptions, and other functions. All combos/ensembles include current students enrolled in JAZZ HOUSE KiDS Big Band, Dynasty Band, Legacy Orchestra, Messengers, Blues & Roots and more. These are ensembles that have taken home top awards from major regional /national high school jazz competitions. For more information on our Emerging Musician Concert Program, please contact Candice Reyes at creyes@jazzhousekids.org or at 973-744-2273.